A house in Riverhead, home to much of Long Island's remaining farmland. 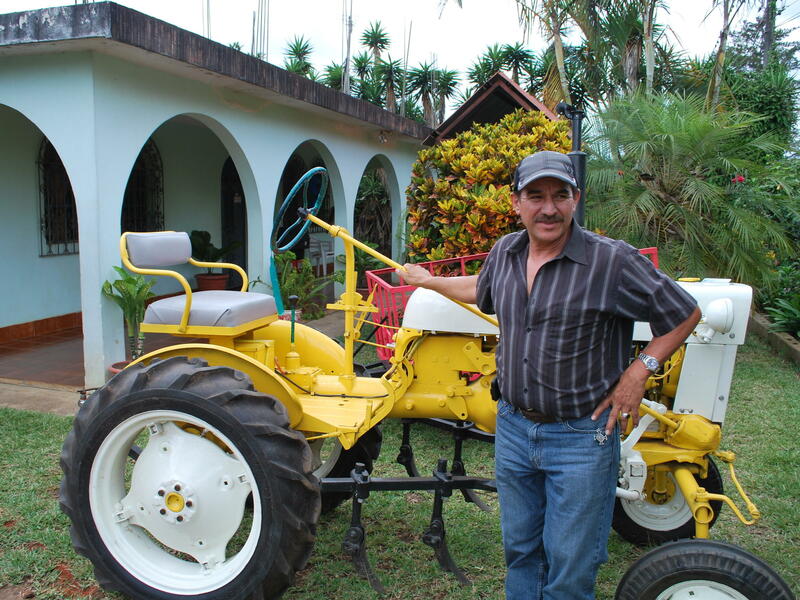 Danilo Garcia outside his home in San Raymundo, Guatemala, with a tractor he bought in Riverhead, N.Y.
For four decades, San Raymundo in Guatemala has been a source of workers for Riverhead, home to much of Long Island's remaining farmland. Riverhead is also home to the area's fastest growing Latino population. Danilo Garcia came to the U.S. in the 1970s. 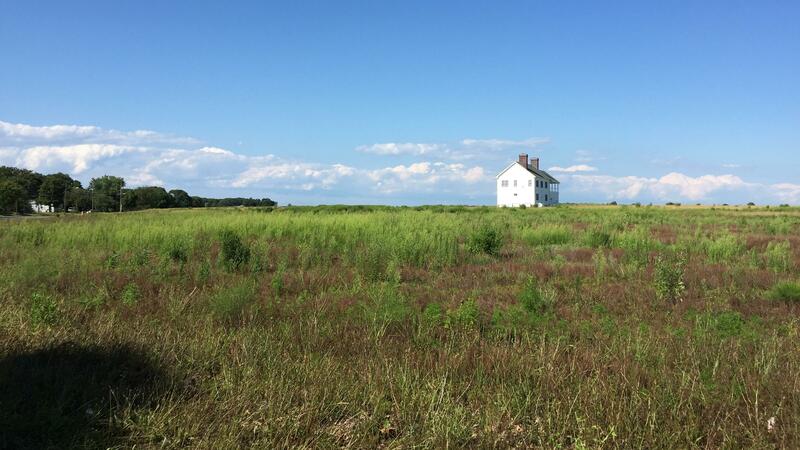 Like Garcia, many others heard about Riverhead from friends and relatives in San Raymundo and made the journey to work in Long Island's sod, grape and vegetable fields. Garcia started as a farm worker 30 years ago. Now he trims trees across Long Island, including estates in the Hamptons. He's made enough money to build a house, a pool and a basketball court for his three sons who are living with their mother in Guatemala. Garcia splits the year, spending a few months working in Long Island and a few months with his family back home. "We work sometimes seven days, we work 14 hours," he explains. Garcia says it's all thanks to Trancito Perez, a relative who told him about Riverhead, and the first man from San Raymundo to stumble upon Long Island. Perez still lives Riverhead, not far from the farm where he made his start 40 years ago. "In that time, it was very, very quiet," Perez says. "Not too much noise." Perez left Guatemala when he was 27 years old and got a factory job in New Jersey. He started to miss farming, which he had done back in San Raymundo. When he heard there were farms on Long Island, he found a job with a farmer in Riverhead. Perez ended up working side by side with Bill Nohejl, the farmer's son, for years. "We came to an understanding," Nohejl says. "Look, try and remember as much English as you can, and I'll try and do as much Spanish. So half the sentence was in English and half of it was in Spanish, just back and forth. We kind of taught one another." Nohejl and Perez became as close as family. The Nohejls eventually hired three of Perez's relatives from Guatemala. Other farms hired Perez's relatives as well, and eventually, a connection was born. Immigration from Central America is quickly changing parts of Long Island, and experts say networks of family and friends are linking one town to another. It's not by chance that immigrants settle in where they do. They arrive through established connections between towns in Central America and towns on Long Island. "That's exactly how it is with my family," says Hansel Perez, Trancito Perez's son. "I feel it's incredible and bizarre." Hansel Perez is a video producer for Bloomberg LP in Manhattan. Trancito Perez's other son, Byron, became Riverhead's first Latino police officer in 2014. Hansel Perez grew up watching his parents nurture a young Guatemalan community in Riverhead and help many navigate a path to citizenship for undocumented immigrants in the 1980s. "These were boys," he says. "No matter how tough they are, they're still children and they're over here. And my mom kind of became like a mother to everybody." Trancito Perez is 68 years old now. He cares for his adult daughter, who has cerebral palsy. He worries about where she'll live after he dies. "You know, I'm very happy," Trancito Perez says. "I don't know how long I be in my life. But I'm very happy for my kids." He says that when he retires, he'll stay close to those kids in Riverhead. In the meantime, he'll continue to work on a farm. Immigration can be a messy affair. The history of who arrived exactly when and where is often lost to time. But hundreds of Guatemalans in Long Island can trace their roots back to a single man.  Will James of member station WSHU followed that man's steps back to San Raymundo, Guatemala. WILL JAMES, BYLINE: San Raymundo is an hour's drive north of Guatemala's capital on a bumpy road lined with mountain views and a river choked with garbage. JAMES: So this is how it all starts. Danilo Garcia says he grew up here with eight siblings and no shoes. He left school after sixth grade and started cutting sugarcane for money. But he says his life changed when he was 16. A relative who had been working on a farm in Riverhead, N.Y., came home to San Raymundo to visit and talked about life on Long Island. GARCIA: I say, I like to go to the United States, too, I say. Maybe we can go together, he say. JAMES: But later, they set off separately. GARCIA: He left. Then I left, too. I was 17 years old. JAMES: For four decades, this town has sent workers to Riverhead, home to much of Long Island's remaining farmland and the island's fastest-growing Latino population. Like, Garcia many heard about Riverhead from friends and relatives here in San Raymundo and made the journey to work in Long Island's sod, grape and vegetable fields. Garcia started as a farm worker 30 years ago. Now he trims trees, and he's made enough money to build a house, a pool and a basketball court for his three sons here in Guatemala. GARCIA: We work sometimes 7 days. We work 14 hours. JAMES: He says it's all thanks to a man named Trancito Perez, the relative who told him about Riverhead and the first person from San Raymundo to stumble upon Long Island. TRANCITO PEREZ: Hello. How you doing? Perez still lives in Riverhead not far from the farm where he got his start in the town 40 years ago. T. PEREZ: In that time, it's very, very quiet, not too much noise (laughter). JAMES: Perez says he left Guatemala at 27 and got a factory job in New Jersey. But he missed farming like he did back in San Raymundo. He says he heard there were farms on Long Island. And one day, he appeared at the doorstep of a farmer in Riverhead who gave him a job. Bill Nohejl is that farmer's son, and he worked side-by-side with Perez for years. BILL NOHEJL: We came to an understanding. Look; try and remember as much English as you can, and I'll try and do as much Spanish. We kind of taught one another. JAMES: Nohejl says he and Perez became as close as family. The Nohejls eventually hired three of Perez's relatives from Guatemala. Other farms hired other relatives, and a connection was born. Immigration from Central America is quickly changing parts of Long Island, and experts say this is how it works - through networks of family and friends linking one town to another. HANSEL PEREZ: (Laughter) That's exactly how it is with my family. I feel like it's incredible and bizarre. JAMES: Trancito Perez's son Hansel is a video producer for Bloomberg L.P. in Manhattan. His other son, Bryon, became Riverhead's first Latino police officer in 2014. Hansel says he grew up watching his parents nurture a young Guatemalan community in Riverhead and helped many navigate a path to citizenship for undocumented immigrants in the 1980s. H. PEREZ: These were boys. You know, no matter how tough they are, they're still children. And they're over here. And my mom kind of became, like, a mother to everybody. JAMES: Trancito Perez is 68 now. He cares for his adult daughter who has cerebral palsy, and he worries about where she'll live after he dies. T. PEREZ: You know, I'm very happy. I don't know how long I be, you know, my life. I'm very happy for the - my kids. JAMES: He says that when he retires, he'll stay close to those kids in Riverhead. In the meantime, he still works on a farm. For NPR News, I'm Will James on Long Island. Transcript provided by NPR, Copyright NPR.